2014 kicks off with funding success for Slapstick & Slaughter and an Articulture commission opportunity for the Wye Valley River Festival! The weather may be stuck in winter but we’re frisky as Spring onions and ready for anything, so let us know if you have a project we can help with: office@desperatemen.com or 0117 939 3902. 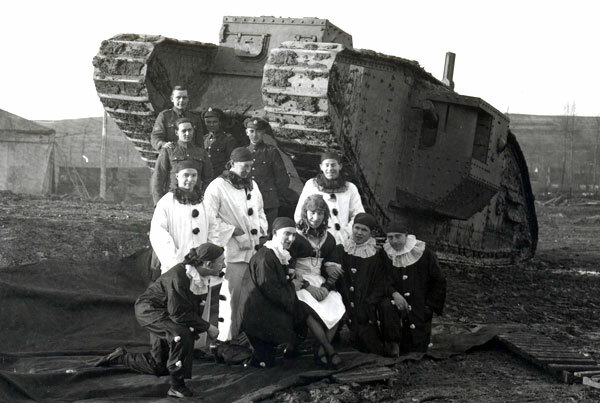 A First World War concert party at Central Stores, Tank Corps (Imperial War Museum copyright). We are delighted to have gained Arts Council funding for our new small-scale show SLAPSTICK & SLAUGHTER, which will explore the impact of World War One on culture and the arts. Currently in development, the show will examine how the war’s barbaric chaos manifested itself in the sometimes surreal, sometimes nihilistic art that grew from it. The show is designed to work indoors and outdoors and we are taking bookings from April 2014 onwards – get in touch now to find out more or go to the website for more information. We will be developing further partnerships for it through the Imperial War Museum’s World War One centenary memorial programme. Articulture is seeking proposals for a small-scale outdoor arts commission to be part of the Wye Valley River Festival, for which we are artistic directors. The application deadline is February 21st and you can find out more on this link. The Wye Valley River Festival is a new initiative by the Wye Valley AONB (Area of Outstanding Natural Beauty) which takes place in May 2014, with a series of events running along the river from Hereford to Chepstow. Our draft programme follows a narrative of ‘the river on trial’, as Ratty the water-vole and other Wye Valley animals are arrested and accused, with a Grand Assizes in Monmouth’s 16th century courthouse leading to a spectacular showdown at Chepstow Bridge. The festival is funded by Arts Council Wales and the National Parks and AONB Sustainable Development Fund and partners include National Theatre Wales, Articulture and Adventa. There’s still a handful of spaces left on a performance masterclass with Jon Beedell and Gerry Flanagan (Shifting Sands Theatre) in the Desperate Men Studio, March 14-16. Discover how to turn stories into theatre, bringing words alive using movement, action and simple props. Book now – places are limited. WIth the theme of ‘Pantomime Dames’ this is sure to be a vintage year, get your apron on and your frying pan out and prepare to flip like you’ve never flipped before. Henrietta Street, Easton, March 4, 7pm start for races and audience. Prizes include Best Dressed and Best Freestyle Toss. Get involved! Richard performed in ‘An Evening with Parlor Dance’ at the Bridport Arts Centre in January as part of the R&D for a new piece called ‘Home from Home’ that looks at the nature of care in its various connotations. Helen Parlor will be choreographing Slapstick and Slaughter and was Assistant Choreographer for the London 2012 opening of the Paralympic Games. Here’s a lovely video of PIA Artistic Intervention Projects show ‘Factor E’ which Jon directed for Ciencia na Rua (Science in the Streets) festival in Estremoz, Portugal. ‘Factor E’ explored harnessing human energy for love, electricity and power showers. Post by PIA – Projectos de Intervenção Artística. A Ship Of Fools theatre company, Ramshacklicious, PIckled Image and Hobbit have all been in the studio. Yoga classes are ongoing on Tuesdays. Slots are still available for rehearsal so get in touch if you’re looking for space.